This week, I thought that I’d step back from the official fencing equipment and play a fun little game. It’s called: What’s In That Bag? Here’s the idea. Suppose you are writing about a character that fences, knows fencers, stumbles upon a fencing tournament, or even finds a closet of old fencing equipment. I’ve mentioned the types of protective equipment and the weapons that would be used. I’ll get to scoring boxes, reels, and strips later. But what other interesting tools and equipment might be found alongside fencing gear? Let’s go take a look. First off, there are several types of fencing bags. I’ve been through three or four different ones. The bag that I own now is a bit of an unusual design, but it works for me. Most bags are of two types: a teardrop shaped bag carried on a single strap over the shoulder, or a wheelie-bag which is usually a larger rectangular bag with wheels on one end. For routine practice, I carry a separate duffel bag for the sweaty stuff. 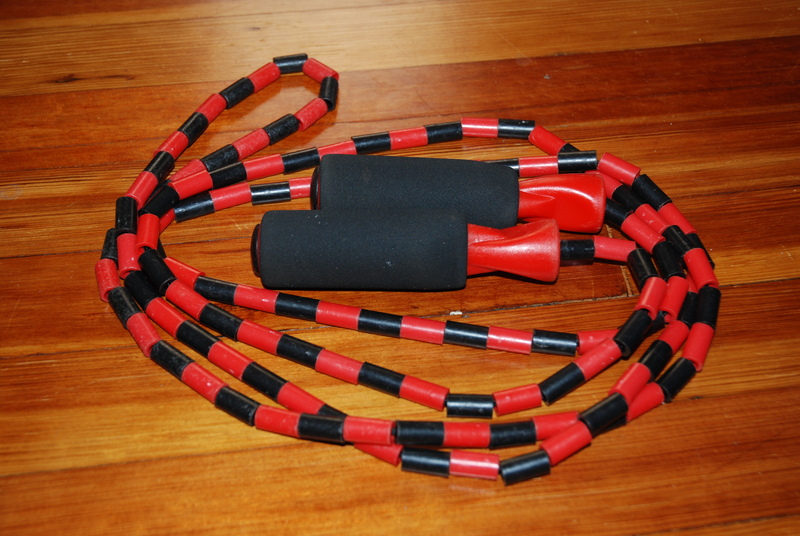 1) A jump rope – I use this to keep my heart rate up between bouts on days at practice when I’m feeling extra-motivated. If your characters have a situation that requires a rope, a stash of fencing equipment might be reasonable place to find at least a short one. I also found a pair of extra shoe laces in a side pocket of my bag – another item that might be useful as part of a trap, magic device, or hey, just to use as shoe laces. 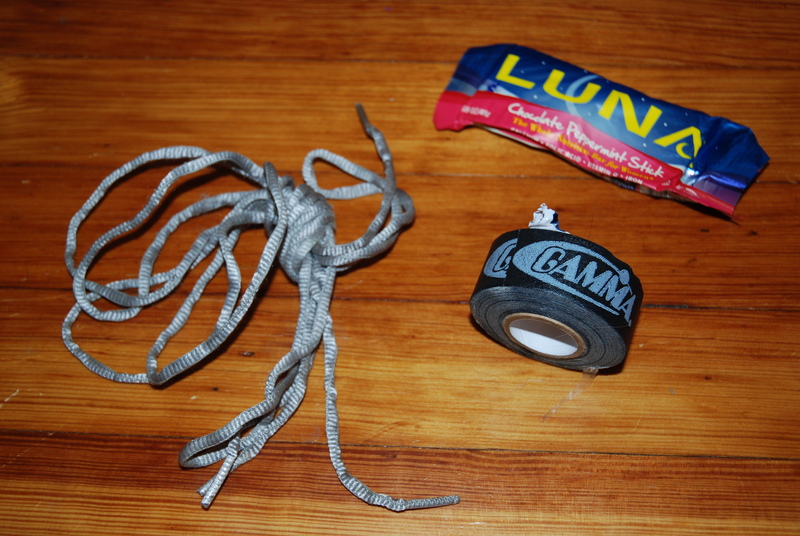 Extra shoe laces, a frighteningly old energy bar, and a roll of tape. 2) A water bottle and an old energy bar – The water bottle in my bag today was empty, but sometimes I leave a partially full one in there. Perhaps your character needs water. 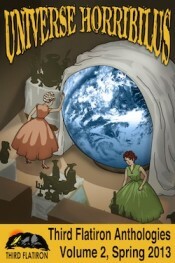 Or perhaps your wizard needs a container for a potion. Or a poison. The energy bar may have been in that side pocket for years. I’m not going to eat it, but a desperately hungry character might. 3) Vise-grips – This is the primary tool that I use to assemble a sabre. The pommel needs to be tightened a little more than I can do by hand. 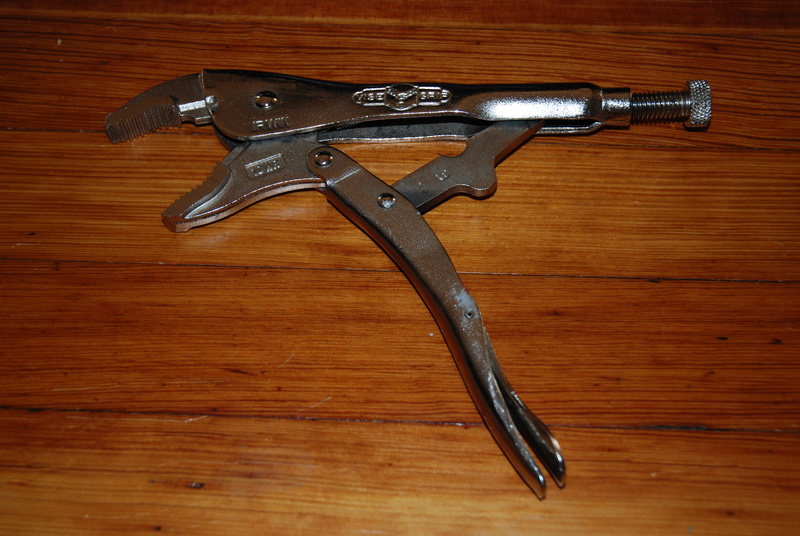 Many foil and epee fencers use pistol grips which require a hex tool to tighten. A larger pair of Vise-grips would probably be able to hurt an enemy if your character used it like a club. 4) Electrical parts – This consists of extra pieces of wire from defunct body cords, electrical tape, soldering iron, and an Ohm meter. I no longer carry the soldering iron or Ohm meter, but when I had the patience to repair body cords, they were useful. 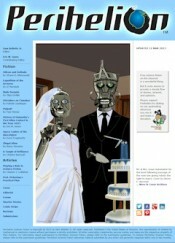 If you’re writing a science fiction story, there could be numerous uses for these items. Two rolls of foam underwrap, Biofreeze, and an elastic knee support. 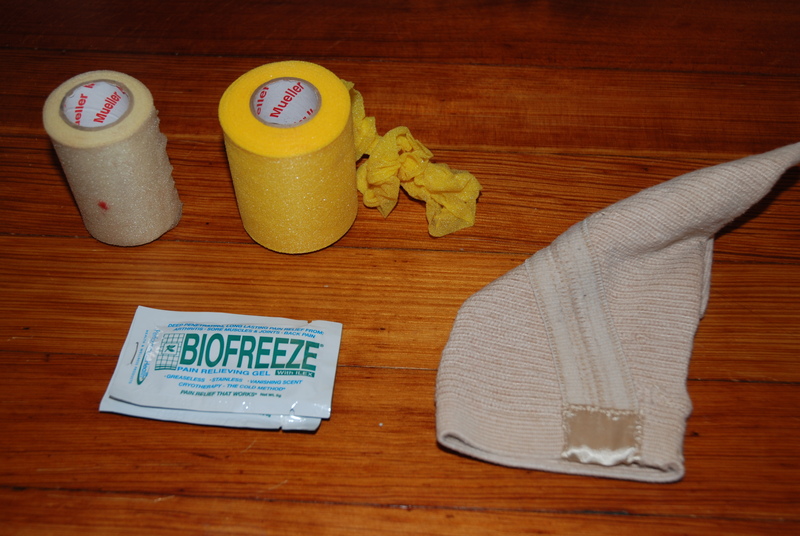 5) Medical supplies – Today I found a roll of foam underwrap, a few Biofreeze packets, and an elastic knee support in my bag. I’ve never used the Biofreeze. I think it was a free sample and claims to be a pain-relieving gel. At other times, I have carried those instant ice packs and various other supports and braces. I think that I own every type of ankle support in existence. I don’t think that it would be unreasonable for your characters to find bandaging materials or simple pain-relieving medications (Advil, Aleve) among fencing equipment. 6) USFA Card – This is something that currently lives in my wallet, but it used to be in my fencing bag. It also used to be a flimsy piece of paper, but now it is a hard plastic card that could probably be used to shimmy open an easy door lock. 7) The rest of it – I also discovered a notification that TSA had searched my bag at the airport, assorted pieces of plastic and packaging, and spare and broken pieces of fencing equipment. Maybe a survivalist could figure out some practical uses for these things. At least the packaging material would burn. I have hung a banner using broken sabre blades as supports. So for any fencers out there, is there a non-equipment item that you absolutely MUST have in your fencing bag that is not listed here? Does anyone carry something odd for luck? If you missed my last post, follow the link in the next older post to see the interview with two-time Olympic gold-medalist Mariel Zagunis. AND today’s goodie: Here’s another link to an interview with a member of the US Olympic Fencing Team, Tim Morehouse. For the next few months, I should be back to posting every 2 weeks. Next time – THE MOST IMPORTANT THING in fencing, and likely other martial arts and combat sports. Fascinating, Clare. Of course, some of the more modern items would need less techy equivalents, depending on the time/place of a story. Not much electricity in the middle ages. On a serious note, fencing is something I knew almost nothing about, so thanks for your well-crafted posts on the subject. Thank you, Ann. I’m hoping that some of my next posts can be more broadly applied to other types of sword-fighting. Modern fencing is, well…modern. 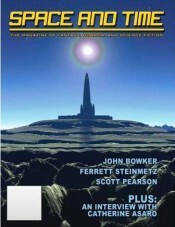 But there are commonalities to the strategy and use of distance that I think could be applied to many styles of combat.